Guest Speaker: Mr Andy Burnham, Mayor of Greater Manchester Combined Authorities. Andy Burnham, Mayor of Greater Manchester Combined Authorities, addressed an audience of more than 100 delegates and members of the public at Sunday’s meeting of the Jewish Representative Council of Greater Manchester and Region at the Nicky Alliance Centre. Mr Burnham was introduced by Council President, Sharon Bannister, who described his extensive and varied political career. Humbled by the 63% of the vote that he received, Mr Burnham said that he intends to be a Mayor for everyone not just for the Labour voters. He also intends to break away from the world of political point scoring and engage with everyone. After 16 years in Parliament, Mr Burnham feels that a centralised system of government that is London-centric has shown itself to be largely dysfunctional. The North West has suffered from various central based decisions, such as the promotion of owner occupation which has led to a housing crisis; focus on service industry at the expense of local manufacturing; and neglect of technical education for younger people. There has also been a failure by central government to invest in the NW infrastructure. People’s frustration in the current system was reflected by the outcome of the EU Referendum which was in effect a vote against Westminster and Brussels. Mr Burnham quoted the Mayor of Denver who said that, “The 19th Century was a period of Empire; the 20th of National Government whilst the 21st is the century of City Mayors and Regions”. In Mr Burnham’s opinion, embracing devolution would seem to be the best answer to an over concentration of power in Westminster. He wants to make Greater Manchester the best place for young people to grow up and where people can grow old with dignity. He has been inspired by the Jewish ‘person centred’ approach to social care and feels that The Fed is a role model for the rest of Greater Manchester and for the whole country. The ‘old way’ has been to rely on Public Services but the new system that Mr Burnham proposes requires the Private and Community Sectors to work in conjunction with funded Public Services. He described a new homeless project which he supports with 15% of his salary. Chaired by Ivan Lewis MP and Beth Knowles, this project has recently opened a 15 bed unit in Cheetham Hill. Mr Burnham is also focusing on setting up support for the 30% of families in the NW that fail to prepare their young children adequately for school. Mr Burnham was proud that Manchester has always been a centre for innovation and is famous for the start of many world changing movements including the Suffragettes, Trade Unions and the Co-operative movement. He feels that it is time to do it again through the devolution of power from central government. In answer to questions from the audience, Mr Burnham described how, together with the other North of England Metropolitan Mayors, he wants to establish a Council of the North which will have a stronger lobby for greater devolution of funds. Many devolution initiatives are dependent on central funding which has not been easy to come by in the last year or so. He feels that key areas for development in the NW include advanced manufacturing; digital and technological developments; low carbon and renewable energy; and assisted living. He accepted that there needs to be greater representation of minority groups in services such as the Police, Fire and the Health Services and crucial issues are better addressed at regional level. He described how he met Joel Barnett when he was the Chief Secretary for the Treasury, who wanted him to scrap the ‘Barnett Formula’ which had only been intended as an interim measure. 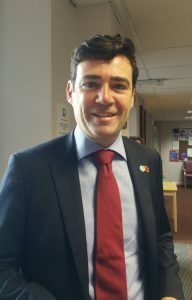 When challenged about problems caused by bed blockers in the NHS and the difficulties that the Voluntary Sector has in dealing with different Local Authorities payment rates, Mr Burnham described how he has proposed for GM to break out of the NHS payment system in favour of a ‘Year of Care’ approach. This will consolidate medical and social care creating standardised rates and incentivising the NHS to work more closely with its partners. A concordat has recently been signed between GM and the Voluntary Sector to provide greater stability. ‘Bridge GM’ is a new GM wide mentoring scheme which is being implemented to promote work shadowing, intern programmes and other similar projects that address issues such as loneliness amongst the elderly and support for parents with young children. Rabbi Councillor Arnold Saunders gave a vote of thanks to Andy Burnham.